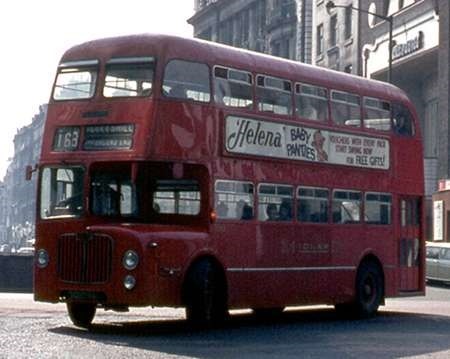 Midland Red 6225, UHA 225H, is a Daimler Fleetline CRG6LXB with Alexander H45/30D body, and was new in 1969. It has been restored into West Midlands livery and I include a picture of it’s Gardner engine. Both of the shots were taken last weekend at the AMRTM (Aston Manor) running day. One of the Fleetlines at Southgates Garage was fitted with a Leyland pneumatic Gear change pedestal instead of the usual electric gear shift. This made for much smoother gear changes, I don’t know if it was a one off experiment or not but it was certainly an improvement. As a Fleetline Fan and driver at Lancashire United in the 70’s, there was absolutely nothing wrong at all with the Fleetlines Daimatic semi automatic gearbox. Had you been a passenger whilst I was driving, you be hard put to tell any of my gear changes, upwards or downwards, apart from the revs changing. No need to put anything of Leyland origins in any Daimler buses! Totally agree, Mike. My experience with the ‘pedestal’ Leyland Pneumocyclic box showed that it was very slow in responding to movement of the gear selector lever. Smooth gear changes required one to anticipate the action of the gearbox. To change gear upwards, one had to move the lever into neutral and only then release the accelerator, pause, then engage the next gear position, and pause again before pressing the accelerator again. Similarly, changing down meant selecting neutral whilst still holding the accelerator, blipping the engine, moving the lever into the next gear down and only then pressing the accelerator again. Lazy drivers not bothered about this would give a snatchy ride and wear out the gearbox brakebands. The SCG gearbox and its licensed versions always gave instantaneous response to gear lever movements. I have to agree that uncomfortable and unpleasant gear changes on semi-automatic gear boxes were, assuming the gearbox was properly maintained, almost certainly due to lazy driving techniques and a lack of pride in doing the job to the best of ones ability with management either unaware or uncaring of this habit plus it annoyed those who did do their very best. The Leyland direct air operated gear change did need the technique so accurately described by Roger but was by no means as difficult to master as it may sound and I came to enjoy using it perhaps because it needed that little extra thought to get the best out of it. 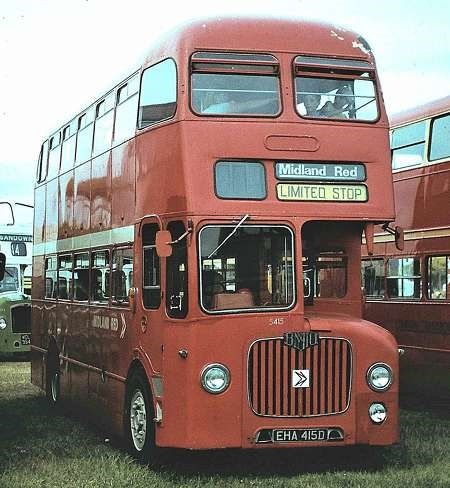 Midland Red had three classes of Fleetline/Alexanders. The first 50 arrived in 1963 and were classed DD11. During 1966 to 1968 a total of 149 very similar Fleetlines, class DD12. Finally, between 1969 and 1971 came the DD13s – 103 in all, including UHA 225H. The DD13s had centre exits and also Gardner 6LXB engines, which gave a rather better performance than the 6LXs in the other two classes. Many, possibly most, DD12s were retrofitted with pneumocyclic gearboxes by the early 1970s, as described by Tony Gallimore. I have never found out why. No DD11s or DD13s were so converted as far as I know. I seem to recall that in the 1980s a handful of Fleetlines that Midland Red South obtained from West Riding had pneumocyclic gearboxes. Was this correct or am I mistaken? I, too, liked the pedestal-change conversion on the DD12. It was located by your left hip and encouraged you to sit more upright when driving, doing wonders for back and shoulders! The DD11s were probably excluded due to age, and the DD13s because of the exit door control. 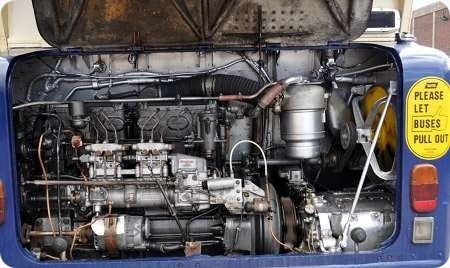 Does anyone remember DD11 5261 when it was powered by a BMMO 10.5 engine? Any facts, particularly from engineering staff, gratefully received. With regards to the comment on DD1 5261 I remember this vehicle during my early teens when I was a Midland Red enthusiast, it was based at Sutton Coldfield and could be seen on the 160 family of services at peak times, in my opinion it out performed the other dd11’s but was extremely noisy in the lower deck, another of my favourite buses was D9 prototype 4773 located to Sheepcote Street ( a regular performer on the above services), really miss those great days, sadly left the Birmingham area in 1967. Re. 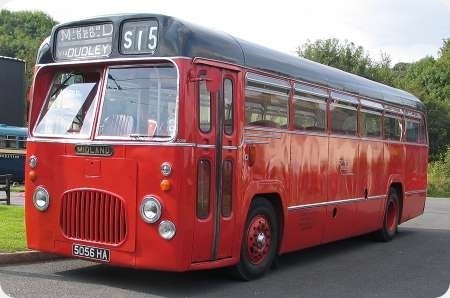 Peter Hale 6/IV: Midland Red (South) acquired 4 of the PHL XXXK Northern Counties-bodied Fleetlines from WRAC in 1985. Unfortunately, I can’t comment on the transmission. However, I do remember travelling from Oadby into Leicester in early 1985 aboard one of Midland Fox’s ex-Yorkshire ECW-bodied LHD XXXK Fleetlines: what struck me was that gear selection was by a Leyland pneumocyclic selector, which was mounted to the side of the instrument housing (where you’ld expect to find the smaller SCG selector) . . . and selection was automatic (as the selector lever was left in the same position throughout the journey. (Trent’s Fleetlines DRC536-551J [536-551] had a similar arrangement.) And yes, my memories have been stirred by "Midland Red in NBC Days", (Geenwood/Roberts, Ian Allan,) which I picked up at the weekend. A lot of the D12 class Fleetlines had the Leyland style pedestal changes, but not all. It’s never been quite clear if it was a Midland Red modification. Regardless of gear selector type, the gearbox remained the same. The fierceness or otherwise of the gearchanges is down to the setting of a valve which regulates the pressure of the air being supplied to the gearbox, via the EP Valve. (the pedestal changes had the EP valve built in). This regulator valve was adjustable, and they were frequently set wrongly :in those days companies overhauled their own units, valves etc, and when the regulator valves were assembled, the adjuster screw would just be screwed in and locked in any old position. A test rig would have been needed to set the pressure correctly, and nobody was going to build one for something like this. So valves were fitted to buses and the pressure would often be set too high causing fierce changes. Likewise no-one was going to go to the trouble of fitting a pressure gauge into the line on the bus to get the pressure right, so it was down to trial and error, if anybody could be bothered. 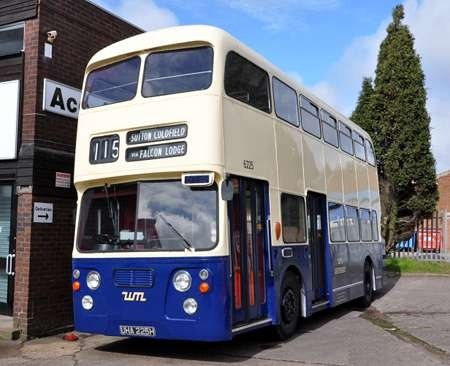 I remember when WMPTE Stourbridge Garage closed and Oldbury inherited their National 2’s – they used to leap in the air almost the gearchanges were so bad. Once they were all adjusted the difference was remarkable and it was impossible to get a bad change then, no matter how you tried. I’ve just noticed that the engine shot of 6225 reveals it has been retro-fitted with an air accelerator, using the same make of rear cylinder as found on National 1 (510), prototype Metrobus, and others. No doubt this has been done because of a stiff throttle: the most common cause of this was the accelerator pedal heel/hinge becoming dry and seizing up over time. Seems a lot of trouble to go to, especially as you don’t have the same amount of control as with the hydraulic system normally fitted. The comment about the transmission on the ex.Yorkshire Woollen ECW bodied Fleetlines at Midland Fox surprised me. They must have had their transmissions altered by their new owners because when they were at YWD they had normal four speed gearboxes with a 5th position on the gear lever to open the entrance door. 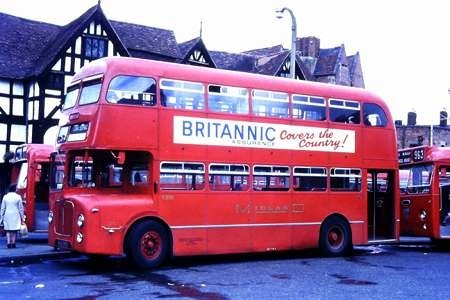 I am of an age where I remember the DD12 & DD13 buses running with Midland Red (later Midland Red East and Midland Fox) in Leicester. Three buses of these types that spring to mind that regularly worked my local routes were GHA 429D, SHA 870G & UHA 207H. They were nice buses but rattled well from what I can recall. Re. Philip Carlton 25/06 (and sorry to have taken so long to have replied – I must have missed the post): it was how unusual this feature (direct pneumocyclic selection) was that struck me – I must have used vehicles from this batch once or twice in Yorkshire, but never noticed that . . . so I suspect Philip is right, that Yorkshire’s LHD XXXK Fleetlines were modified after arrival at Midland Fox. Why? it seems an awful lot of expense on already long-in-the-tooth hardware. Having both being a conductor and a driver for BMMO in the 60s I have driven most of the buses used during this period D9 buses I found to be very stable much more than the Leyland that were purchased, these were terrible in windy conditions especially when winds were blowing between houses, you could often be on the wrong side of the road. The Leyland National also difficult to pull onto bus laybys when there was a line of raised "bricks"/kerbstones when the road was wet no such trouble with BMMO. Having the front wheels set back as the D9s were meant a much smaller turning circle. Disc brakes fitted in 1959 for C5s etc how advanced can you get most cars of that era did not have these.4943/4 both at Stafford at the end of there life another innovation engine under the floor better balance than rear engines of Leyland F Fleetline which were very light at the front. Moving away from the transmission to the bodywork, when Alexander initially designed the A style body back in 1962, it incorporated the windshield and upper deck front windows that were supplied on the Y series coach body as windshield and rear window respectively. I can understand why BMMO specified the easily fitted split windscreen as replacement of the original after damage could be costly, but why go to the trouble and expense of redesigning the upper deck window arrangement? No other BET company operating the Alexander body seemed to have trouble with that the upper deck window and none to my knowledge either followed the BMMO redesign or made changes of their own.